the head of a monastery. The Khenpos have been the main channels for keeping the purity of Buddha's teachings alive from generation to generation within the Tibetan monastic tradition, acting as a kind of university tradition. 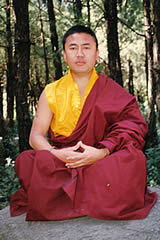 It is extremely rare for monks or Lamas to qualify as a Khenpo; there are thousands of monks, but only very few Khenpos. Monks who have studied for many years do not receive the title as a matter of course; it is bestowed in recognition of special qualities such as profound knowledge and extraordinary skill in helping to teach others. In this way the bestowal of the term Khenpo recognises something considered rare and precious in the same way as the term Rinpoche does. This is why His Holiness the Sakya Trizin recognised Khenpo's special qualities and deep understanding of Buddhist philosophies, both sutra and tantra. Khenpo's parents escaped from Tibet when the communists took over in 1959. Like many Tibetans at that time they endured many hardships before they reached safety. The family lost everything except their lives and started again from scratch in Nepal. They traveled through India doing all sorts of jobs to survive, looking for a permanent place to live. Khenpo's grandparents, parents and several of his older brothers and sisters worked in road building gangs up in the Indian Himalayas to support the family. Their home was a tent by the roadside in both extreme hot and cold conditions, and the children had no opportunites for an education. Khenpo has been a monk for more than 40 years. 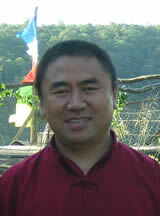 It was into these difficult circumstances that Khenpo was born in 1962. Fortunately by 1966 Khenpo's mother and the younger children found a permanent settlement in Bir in the lower Himalayas, which was then a very remote area. Meanwhile Khenpo's father, elder brother and sister were still away working on the roads. When Khenpo was five years old he started to attend the local school in Bir. By the time he was nine he and his parents agreed that he should become a monk. In Tibetan culture it is a great honour for a family to have a child become a monk. Then followed ten years of intensive training in all aspects of ritual that needed to be mastered: memorising hundreds of pages of text; preparation of sand mandalas; playing temple instruments; chantleading, etc. In 1980 Khenpo left the monastery to go to Sakya College in Dehradun. Many monks wanted to go there but few were chosen. At that time the Principal was the Most Venerable Khenchen Appey Rinpoche, a great Sakyapa scholar and perhaps still the greatest living Tibetan Buddhist scholar of all traditions. Khenpo was fortunate to be considered suitable for entry to such a prestigious college, and was blessed to have the opportunity to study with such a great teacher. ​Khenpo showed great aptitude for Buddhist philosophy subjects. He was selected as a junior teacher at the College, while still preparing for his bachelor's degree. By years 9-10 Khenpo had attained his master's degree in Buddhist studies, and was subsequently selected to be a lecturer at the College by His Holiness the Sakya Trizin and Khenchen Appey Rinpoche. 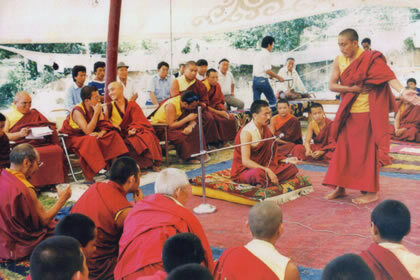 Many of Khenpo's students during this period were Tulkus, and many of his former students are now Khenpos themselves. During the course of these years of study Khenpo passed many examinations, both written and oral. Some were in the traditional Tibetan form of public debate and were observed by His Holiness the Dalai Lama and His Holiness the Sakya Trizin. Khenpo completed his final masters and teaching degree in 1991 and left Sakya College for a year spent traveling in India and Nepal and undertaking retreats. 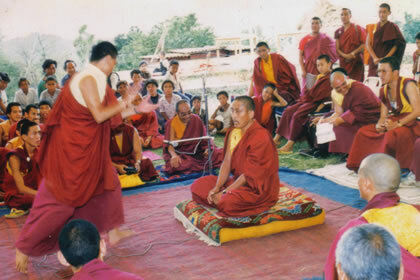 On 8 March 2002, Loppon Ngawang Dhamchoe was given the title of Khenpo in a ceremony at Bir Monastery in Northern India presided over by His Eminence Ratna Vajra Rinpoche, and attended by many senior lamas and dignitaries. 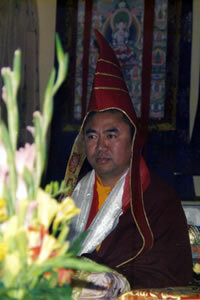 Ngawang Dhamchoe completed his Loppon degree (equivalent to a PhD) in 1990, and was asked several times to receive the Khenpo enthronement, but had declined. However, during the auspicious occasion of the enthronement of the 15th Gyalsay Rinpoche at Bir, and the ensuing Long Life ceremony and Mahakala Puja, a letter of authority was sent from His Holiness the Sakya Trizin via his son, His Eminence Ratna Vajra Rinpoche and Dagmo Kushola requesting that the Khenpo enthronement also be conducted. 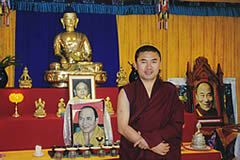 Khenpo means abbot and scholar, and is conferred some time after the Loppon degree has been completed. The conferment of the Khenpo title is an acknowledgment of special qualities and abilities in scholarship and teaching. The title is a reminder to us of how fortunate we are to have such an accomplished teacher who can transmit pure Sakya wisdom to his students in Australia and overseas. 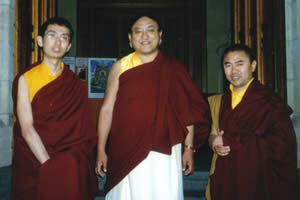 In 1992 Gyalsay Tulku Rinpoche, the head of the Bir monasteries in India and Tibet, requested Khenpo to teach in Singapore, Taiwan and Malaysia. At the end of 1993 Gyalsay Tulku passed away in Canberra, Australia. The Buddhist Centre Gyalsay Tulku had founded in Sydney was in a very difficult position, and the students asked His Holiness the Sakya Trizin to send them a new teacher. His Holiness asked Khenpo to come and see him, and appointed him to be resident teacher at Sakya Tharpa Ling in Sydney. Khenpo agreed because his guru requested him to go, even though he felt unprepared. He knew it would be a difficult job because he had no experience in running a centre, and with very little knowledge of a western culture so different from his own. However, he always believed the guru's blessing was with him, so that gave him strength. 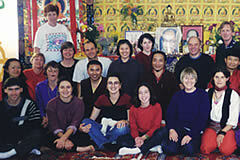 Khenpo arrived in Australia in late 1994 and met with many challenges. Students had drifted away since Gyalsay Tulku's passing, there were not enough members to support the centre, and there were many years of worry about just being able to pay the rent. However, strong faith in his guru and dreams of Gyalsay Tulku kept Khenpo going through the hard time. He gained experience and fluent English, and membership regenerated, even though the Centre had to move premises several times. Eventually the centre was in a position to buy its own home in Rozelle, which was the first permanent Sakyapa centre in Australia. Not long after that historic time the Centre was able to buy a larger building in Strathfield. This became one of the best Sakya centres in the world in terms of its facilities and the spirit and experience of its membership. 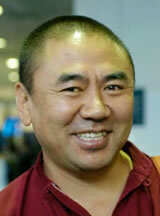 Gyalsay Tulku founded the Sakya Tharpa Ling Centre in Australia and ran it for five years. Khenpo ran it for 12 years, and then felt it was time to move on and give the opportunity to someone else. He wrote to His Holiness the Sakya Trizin asking permission to leave, which was granted. While Khenpo was on pilgrimage in India at the end of 2006, His Holiness asked Khenpo for the second time to become spiritual head of Drogmi Retreat Centre in East Kurrajong (owned by Sakya Tharpa Ling NSW Inc), to the west of Sydney. His Holiness' request was hard to refuse, and Khenpo was also persuaded by so many of his students asking him to return to Australia to work for the Dharma. Most recently, Drogmi Buddhist Institute was founded by Khenpo Ngawang Dhamchoe and formally incorporated in October 2009, with the aim of promoting the understanding, study and practice of Tibetan Buddhism in Australia, and the future development of a retreat centre. Khenpo's ambition is now to teach and work with the Dharma for as long as he can benefit people in Australia. Khenpo achieved great things at Sakya Tharpa Ling with the help of the committee and the support of many hard working members. So with continuing support Khenpo hopes to go on achieving great things in this country in the future, and in his breaks away from Australia will continue to turn the wheel of Dharma overseas.